Our client base ranges widely from small restaurants, retailers and businesses, to large scale projects with Fortune 500 companies. Every day we work hard to develop revolutionary software and solutions for our customers. Our goal is to bring a project to conclusion in a reasonable timeframe and always meet or exceed our customers’ expectations with the end-result. Our strong software tool architecture, strict methodologies, and our quality staff we have assembled result in reliable and powerful software and solutions being delivered on every project we engage in. 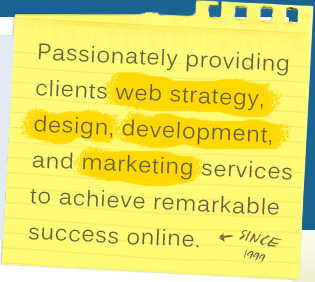 Netmasons is a web design and development agency located in Anderson, Indiana just outside of Indianapolis. We provide design, development, ecommerce, search engine optimization and social media marketing services to our clients.